According to a new market report published by Transparency Market Research titled “Voltage Calibrator Market – Global Industry Analysis, Size, Share, Growth, Trends, and Forecast, 2018 – 2026” the global voltage calibrator market is expected to reach US$ 271.27 Mn by 2026. The market is projected to expand at a CAGR of 5.28% during the forecast period from 2018 to 2026. According to the report, the global voltage calibrator market will continue to be influenced by a range of factors such as rising applications of voltage calibrators across the electronic devices manufacturing process, growing importance of electronic calibration to get higher quality product, and growing distributer networks around the globe that provide voltage calibrators to a large number of end-users. Asia Pacific will continue to be at the forefront of global demand, with the market in the region growing at above 6% through 2026. The global voltage calibrator market is bifurcated by components into hardware, software, and services. Services based component segment is expected to surpass US$ 108.00 Mn by 2026. Voltage calibrators are being extensively used across all industry verticals especially across automotive, aerospace & defense, and semiconductors worldwide, as voltage calibrators ensure reliability and product quality. Voltage calibrators need after sales services such as recalibration, repair, and maintenance services that retains the integrity of the voltage calibration and allows the smooth working of many applications. Furthermore, many market players also provide training and certification services pertaining to voltage calibrators. On the basis of device type, the voltage calibrator market has been segmented into bench type and handheld. The bench type voltage calibrator segment is expected to witness higher market share, due to rising demand across the electronic manufacturing industry worldwide.Bench type voltage calibrators are used for calibration and to maintain the linearity of various electronic devices, namely data loggers, electronic voltmeters, and chart recorders among others. Furthermore, unlike a handheld voltage calibrator, bench type voltage calibrator comes with additional features for providing high level of reliability and accuracy. Additionally, these types of voltage calibrators are used to perform high quality calibration testing in a perfectly maintained laboratory or off-site environment. North America is expected to hold higher market share for voltage calibrators during the forecast period. The contribution is primarily due to the presence of well-established players across the region, especially across the U.S. and Canada. North America is home to many well-established players from the voltage calibrator domain including REED Instruments, Extech Instruments, Valhalla Scientific Inc., and Practical Instrument Electronics, Inc. Furthermore, North America is witnessing higher adoption of voltage calibrators due to continuously rising electronic manufacturing industry across the region. Many companies are trying to capture a larger customer base for additional revenue generation. For instance, PCE Holding GmbH conducts various kinds of marketing activities to capture a larger customer base for significant revenue generation and company development. PCE Instruments, the subsidiary of PCE Holding GmbH, provides different types of calibrators including its own as well as by others brands and participates in different trade shows across Turkey, Germany, and Russia. Additionally, the company also focuses on the web mode as well as printing media to market its products. Yokogawa Test & Measurement Corporation, Extech Instruments, PCE Holding GmbH, Time Electronics Ltd, and AOIP among others are some of the major players operating in the voltage calibrator market profiled in this study. Details such as financials, SWOT analysis, business strategies, recent developments, and other such strategic information pertaining to these players have been duly provided as part of company profiling. Players are focusing on expanding their distributor network around the globe to increase customer reach and to generate additional revenue from voltage calibrators. The “Voltage Calibrator Market – Global Industry Analysis, Size, Share, Growth, Trends, and Forecast, 2018 – 2026” report provides analysis of the voltage calibrator market for the period 2016–2026, wherein 2018 to 2026 is the forecast period and 2017 is considered as the base year. Data for 2016 has been included as historical information. 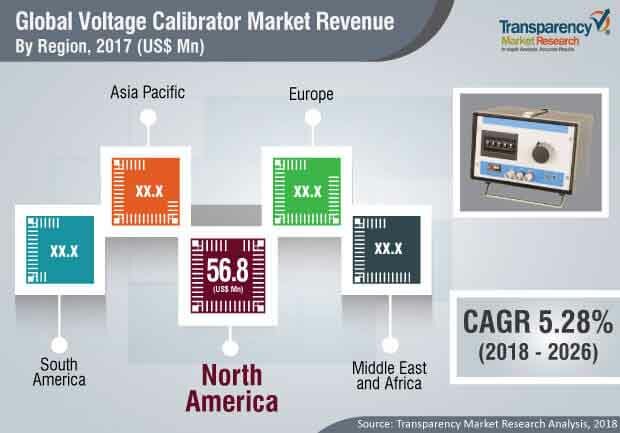 The report covers all the trends and technologies playing a major role in the growth of the voltage calibrator market over the forecast period. It highlights the drivers, restraints, and opportunities expected to influence the market growth during this period. The study provides a holistic perspective on the market’s growth in terms of revenue and volume (in US$ Mn and Thousand Units) across different geographical regions, namely North America, Europe, Asia Pacific, Middle East & Africa, and South America. The report highlights the key trends affecting the market on a global scale. Furthermore, region-wise prominent countries/regions covered in the report includes the U.S, Canada, Germany, France, the U.K, India, China, Japan, GCC countries, South Africa, and Brazil. This research study on the global voltage calibrator market provides a detailed cross segment and cross country analysis based on the different segments including components, device type, end-use, application, and industry vertical. Based on components, the market has been segmented into hardware, software, and services. Services is further bifurcated into after-sales and others. Others includes training and certification services. Based on device type, the market has been divided into bench type and handheld. In terms of end-use, the market has been segmented into laboratory and field. Additionally, on the basis of application, the market is bifurcated into testing and troubleshooting, process device calibration, research and development, and others. Others includes product design and process control. Based on industry vertical, the market has been segmented into aerospace & defense, semiconductor, Healthcare, IT & telecommunication, automotive, and others. Others includes energy and education. The report includes well-established players such as Time Electronics Ltd, Extech Instruments, PCE Holding GmbH, REED Instruments, and Yokogawa Test & Measurement Corporation. These players participate in various exhibitions and events to showcase their product portfolio. For instance, Yokogawa Test & Measurement Corporation is participating in many exhibitions as well as conferences to showcase its product portfolio and to demonstrate the latest technological developments. In recent times, the company has participated in many such events i.e. APEC, OFC-2019, and SPIE Photonics West 2019 among others.